A large, sharp-clawed eagle has caught sight of a family of monkeys who cower in a rocky cave, visible at the bottom right of this scroll. The eagle is about to take off, while the monkeys try desperately to avoid notice. 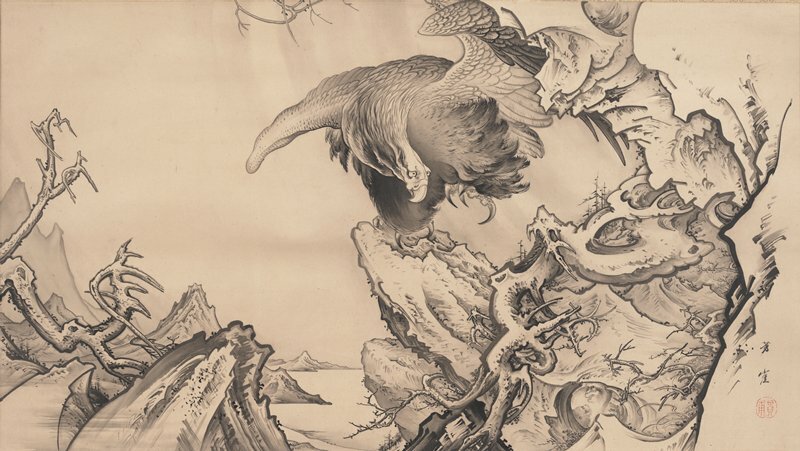 Birds of prey such as eagles and falcons were a specialty of Kano Hōgai, who was among the last artists of the preeminent Kano house of painters. Hōgai often looked back to the subject matter and brush-styles of his Kano predecessors, but he reimagined them with unique brushwork and innovative compositions. He also incorporated painting techniques learned from study Western painting.